New year, new goals. 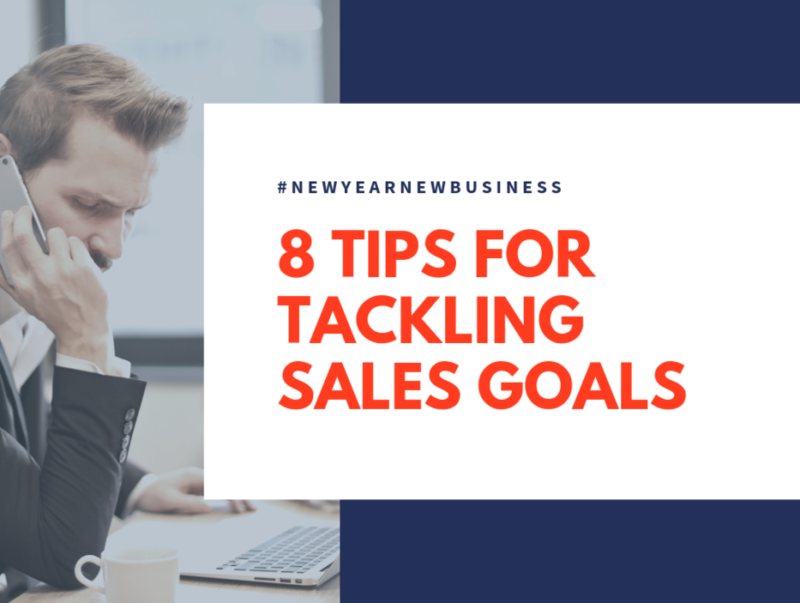 Sales is not a simple profession, but by keeping these tips for tackling sales goals and approaches top of mind, hitting your big goals may just be a little bit easier. Goal setting can be exciting, but it can also be incredibly intimidating. We know planning to crush sales goals even more in 2019 is on everyone’s agenda, so we’ve put together some actionable tips for not only meeting sales goals but dominating them. If you’re looking for a smarter way to open doors, it’s crucial to use a sales intelligence tool to ensure you are keeping your pipeline full of qualified leads. By spending a brief amount of time in a product like Winmo, you can whittle down thousands of contacts into a list of prospects that match what you’re selling. Prospecting can be done in other ways as well, such as providing potential clients relevant information in articles, webinars, etc. that remind them you are keeping them top of mind and making that extra effort to express your interest in them. Communicating great content increases credibility and facilitates effective sales conversations. It shouldn’t always be an ask from the prospect, sometimes you need to give before you take. This doesn’t necessarily have to be related to the product. but offers enough value to make them appreciate it. The best goals are measurable. Rather than always maintaining a big picture view, sometimes it’s helpful to break goals down into what is required of you monthly and even weekly in order to hit your annual target. This approach proves the goal to be much more attainable and will keep you on a specific track to what needs to be done. While a goal can seem intimidating on an annual scale, it typically seems more attainable when broken down into what is required of you in shorter increments of time. This approach also helps you and your team stay focused on progress and determine what still needs to be accomplished. Monitoring goal progression allows you to be more agile throughout the sales process and make any needed changes as soon as possible. Setting a personal goal for a certain number of referrals per week is a very effective strategy. We all know it’s easier selling to a customer who is already familiar with the product, views you as a credible source, and has already shown interest or a need for the product. One way to encourage referrals is to motivate current clients with an incentive, such as a gift card or discount as a prize for referring the product to someone. This step in the selling process is often overlooked, and it is one of the simplest ways to grow your client base working as a team with current product users. Demonstrating to others that your current clients trust you is the best marketing you could do for the company. This comes from a neutral voice and a fresh perspective rather than the company website or your own personal opinion. Don’t let this hide on your website either, mention referrals throughout every step of the sales process in emails, calls, and truly any way possible. It is important that you ask for feedback on two fronts: your customers and your coworkers. As your fellow employees, other sales reps may be able to highlight situations from a different perspective that you have not previously considered. Professional development is an area we emphasize here at Winmo, and when you’re working with so much talent you don’t want to miss an opportunity to learn and grow in your career. On the other hand, asking customers for feedback shows that you value their opinion and that you are trying to provide the best service possible which is always helpful as long as it remains constructive. The best companies are always looking for ways to improve and serve their customers more efficiently, and productive feedback and communication ensures everyone is on the same page. According to studies, your likelihood of contacting a lead decreases significantly five minutes after a lead fills out a web form. In a matter of minutes, your lead’s interest decreases. The average company takes 42 hours to respond to a lead, but leads should be passed and contacted as soon as possible. A whopping 35% to 50% of sales go to the team that responds first. One way to make timeliness a priority is to track the response time for each sales rep. Individually and as a team, this will develop an atmosphere of accountability on staying on top of the competition. One important question to ask yourself is how you end conversations with clients. Clarity throughout the process is absolutely essential for success. Try to make as much planning progress as possible while you have them on the phone. Never leave a customer wondering when or if they are supposed to get back in touch with you. Adding clarity to each conversation will reduce the amount of follow-up and hassle attempting to get in touch with a prospect after initial contact has already been made. In the past, it was possible to sell simply your product or service. However, now it is crucial to pitch the business results that will be found through using the product you are selling. Selling has become more costly while buyers have become more informed. When selling, remember that you are an expert in the field and the first step is to educate on the value your product offers. This can be done by highlighting certain tools within your platform and addressing the best way to overcome competition. You must explain how you are solving the problem, and why saying yes to your product will make their lives easier. Be sure to communicate the results and outcomes you and your company could help them achieve after listening to the specific challenges they are facing. Providing data of prior client success in this step is also encouraging and in turn, adds credibility to your proposal. A big component of sales is using your resources and capitalizing on qualified leads. Cohesiveness with the marketing department is essential for success and will give you more time to sell. Today, you can find an opinion or information about pretty much anything online. Buyers can go as much as 60-70% of their decision-making process without ever having to engage with a salesperson. Modern buyers use social media, forums and other channels to learn more about potential solutions. According to sources, 95% of buyers make their decision based on who provided them ample content throughout different stages of the sales process. Studies also show 68% of customers feel more positive about a brand after consuming content. Your marketing team can provide blogs, white papers, case studies, ebooks and other forms of content to keep your prospects engaged and increase your credibility as a salesperson. Hopefully, these tips are helpful heading into 2019, the year of the closer. As always, request a Winmo trial to see how you can change the game for you and your sales team!